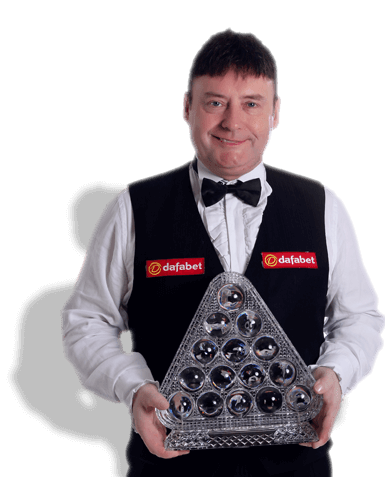 JIMMY WHITE LIVE! AT THE WORLD SERIES OF POKER! Championship 1992; Daily Record Players Championship 2004.
brought joy to millions with his attacking brand of snooker and capacity to play astonishing shots using screw and side spin. and made an immediate impression on the pro ranks by reaching the 1982 World Championship semi-finals at the age of 20, losing a thriller to Alex Higgins 16-15. Two years later, White reached the first of six world finals at Sheffield’s Crucible Theatre, losing 18-16 to Steve Davis. He appeared in every world final from 1990 to 1994, losing four times to Stephen Hendry and once to John Parrott. White’s humility and generosity despite these disappointments further endeared him to the viewing millions. White has won ten ranking titles, including the 1992 UK Championship, and 25 other tournaments. One of his biggest successes was winning the Masters snooker’s most prestigious invitation title, now proudly sponsored by Dafabet – on home soil in his native London in 1984. He also captured the Irish Masters back-to-back in 1985 and 1986. White compiled the Crucible’s second maximum break in 1992 and has made over 300 century breaks in competition. White won the World Seniors Championship in 2010 and, at the age of 52, is currently the oldest player on the professional tour.